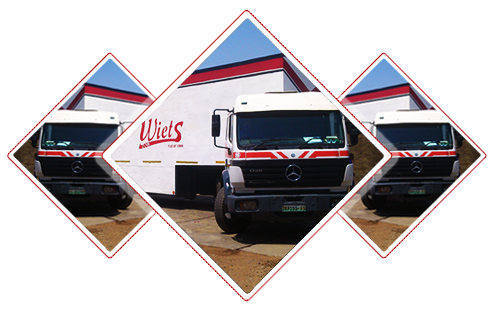 Wiets Transport South Africa - The best way to move! Trusted Furniture Removals since 1966. HOUSEHOLD FURNITURE REMOVALS & LOGISTIC SERVICES IN SOUTH AFRICA. Please complete the form below and we will get back to you. Fields marked with * are mandatory. We are a dynamic furniture removal company, specialising in household removals and commercial transport. We have been in operation since 1966 with our aim to give our clients the ultimate in customer care and satisfaction. It’s our pleasure to introduce to you the WIETS family who will transport your household & commercial goods to any destination in South Africa, whilst handling with the utmost of care. Reliable and trusted Furniture Removals since 1966! As a furniture removal company, we strive to provide you with the peace of mind that your personal belongings and commercial goods will be well taken care of. That is why we have satellite tracking in all our trucks, we provide comprehensive insurance on loads and do no sub contracting to ensure that your household & commercial goods arrive safely at their destination. Should you require insurance regarding the transportation of your household or commercial goods, do not hesitate to approach us. Storage in our spacious and secure warehouses can also be arranged to suit the necessary requirements.